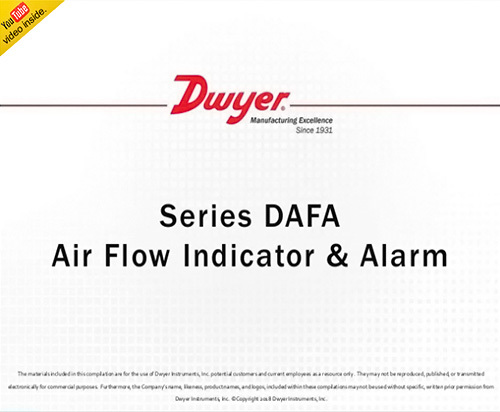 The Series DAFA Air Flow Indicator and Alarm alerts users of low or no air flow conditions in pipes utilizing a thin, field trimmable vane to sense the air flow rate. An 85 dB audible buzzer alternates with a bright red LED to alert users when the air flow rate drops, indicating low or no flow in the pipe. The DAFA is battery powered to provide versatility for where it can be installed, and offers a yellow LED to indicate a low battery. This device is ideal for monitoring radon mitigation systems by detecting a loss of air flow in the pipe and providing a signal to homeowners if the fan has stopped operating. 15 CFM (4" pipe); 10 CFM (3" pipe) on decrease in flow. At least 85 dB @ 1 foot distance. Red LED for no flow alarm; Yellow LED for low battery. ABS, polycarbonate, rare earth magnet. 3 V CR2450 lithium battery, included, user replaceable. 5 years steady state; 48 hours during alarm state. 32 to 122°F (0 to 50°C).